Posted by claralieu in artists, video. 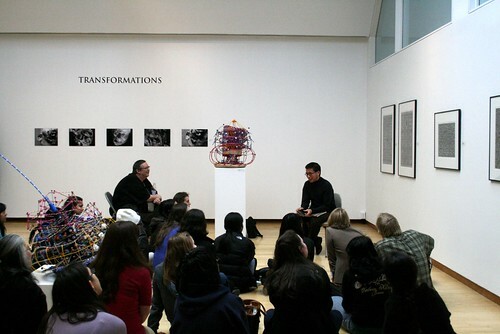 The gallery talk given by RISD Professors Thomas Lyon Mills and Ken Takashi Horii from the “Transformations” exhibition a few months ago is now available for viewing on the Jewett Art Gallery’s new Youtube channel. Click on the links below to view all 6 segments of the gallery talk. 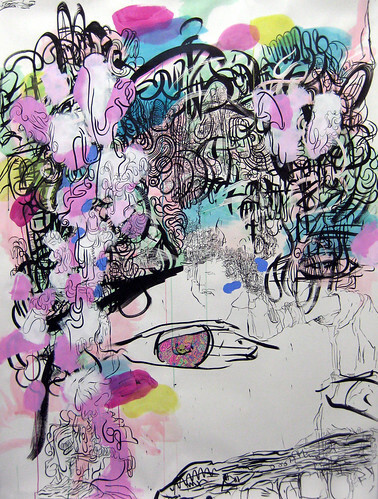 Posted by claralieu in Installing Exhibitions, painting, Student blog posts, Student Exhibitions. Today’s post is a guest blog post by Madeline Vara, Class of 2010. Madeline completed a 350 level project and is participating in “350: Student Exhibition“ which has an opening reception next Tuesday, April 20 at 4:45pm. 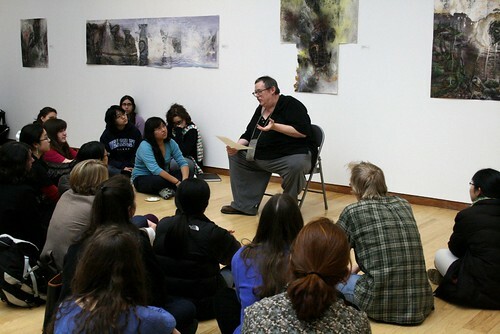 In her post, she discusses the process and experience of installing her project into the gallery space. 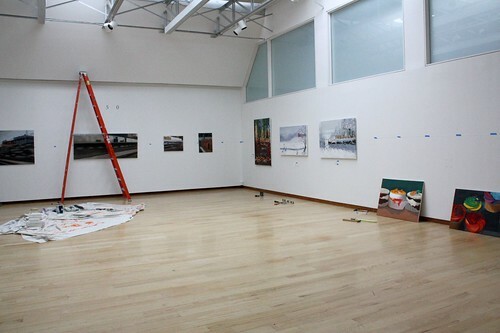 “This past Monday, we began the installation for the 350 show. Though all of the 350 students participating in the show, myself included, were displaying paintings, I found myself with a bit of predicament concerning how to present my artwork. In the case of the other 350 students, their paintings were all on large stretches of canvas, set to be easily hung on the walls. My project had left me with 22 various small paintings, though, with all of them on paper. 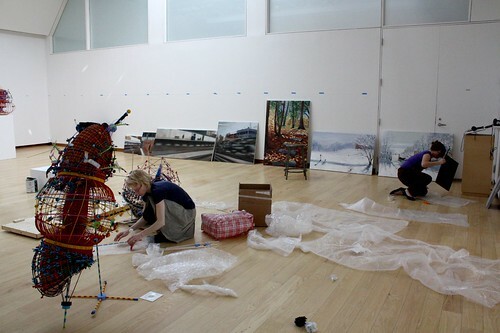 Madeline Vara works to install her pieces into the gallery space. Posted by claralieu in artists, drawing, Gallery Talks, Installing Exhibitions, Opening Receptions, painting, photography. Last week was a busy week in the gallery: on Monday and Tuesday we installed the exhibition “Transformations”, Thursday was the opening reception, and on Friday we had a gallery talk with Ken Takashi Horii and Thomas Lyon Mills. 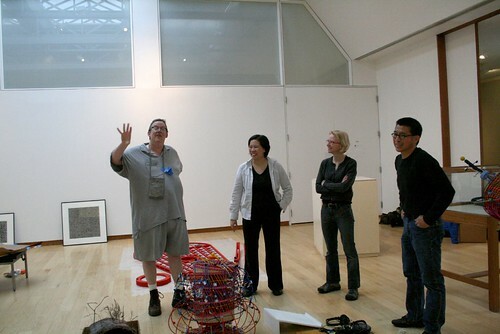 (left to right) Thomas Lyon Mills, Gallery Director /Curator Clara Lieu, Nathalie Miebach, and Ken Takashi Horii discuss the installation plan. 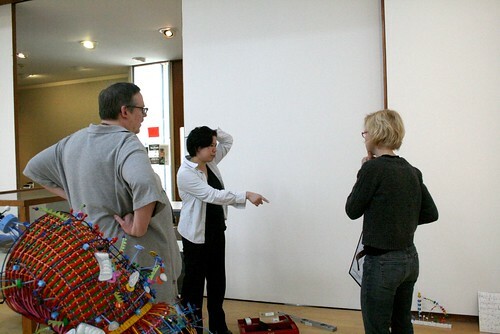 (left to right) Thomas Lyon Mills, Gallery Director/Curator Clara Lieu, and Nathalie Miebach discuss options for how to install the exhibition. 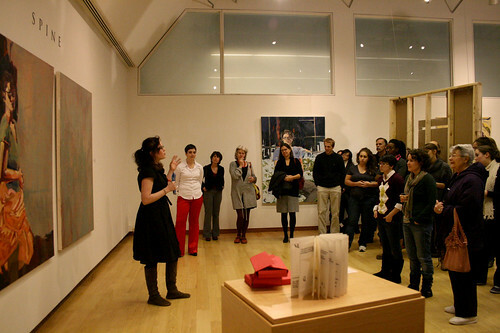 Figuring out the layout for the exhibition was complicated due to the fact that every artist had both two-dimensional and three-dimensional work. 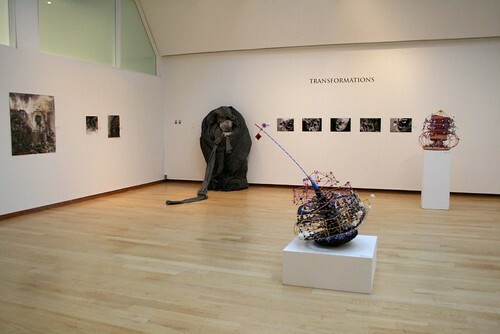 All of the exhibitions we’ve mounted since I started directing the gallery in 2008 have largely featured two-dimensional work, so this was a first for the gallery to have so much three-dimensional work in a single show. Other important considerations were how to distribute and balance color throughout the gallery. Nathalie Miebach and Thomas Lyon Mills both had works which were heavy in color whereas Ken Takashi Horii and Anthony Crudelle-Janello had largely black and white or monochromatic works. 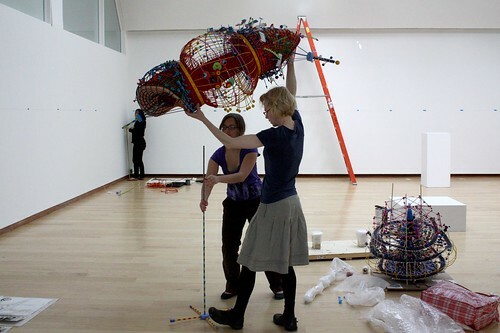 Left: Nathalie Miebach and a student gallery assistant work to assemble her sculpture into the gallery space. 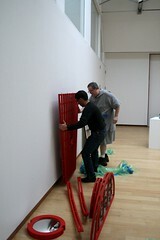 Right: Ken Takashi Horii works on assembling his large sculpture “Of Mind and Matter”. 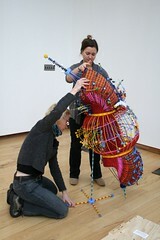 Each artist had their own pre-determined system for hanging and arranging their works in the gallery. In Ken Takashi Horii’s case, his large sculpture arrived in several pieces and was installed piece by piece into the wall. Nathalie Miebach had sculptures and also several audio components which went along with her musical scores. Thomas Lyon Mills had a simple and effective hanging system for his paintings which allowed them to hang on the wall unframed. 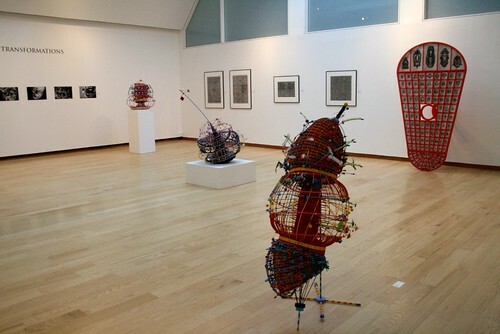 Anthony Crudelle-Janello’s sculpture was constructed on a set of wheels, allowing it to be wheeled right into the gallery. 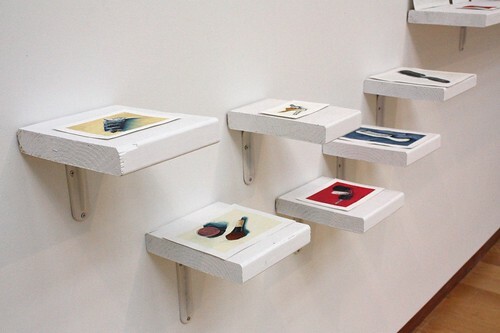 Crudelle-Janello’s photographs were hung on the wall using strips of velcro stuck to the back of the photographs. 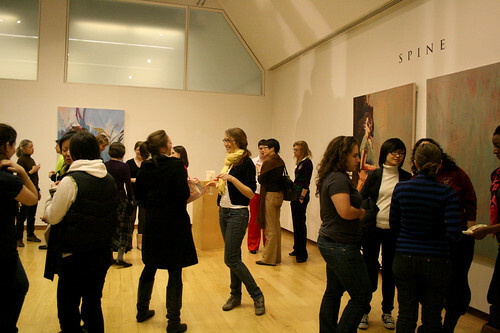 The opening reception was well attended by both members of the Wellesley College community as well as several people from off campus, many of whom were visiting the gallery for the first time. A live jazz performance with piano, flute, and bass was provided by the Wellesley College Music Department. 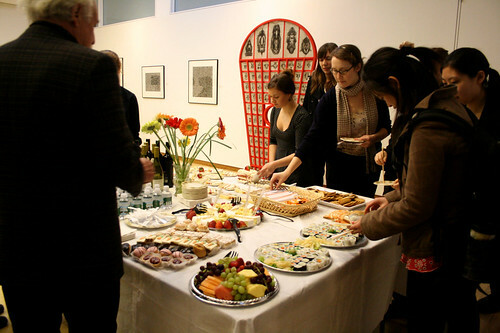 The following day the gallery hosted a gallery talk by Thomas Lyon Mills and Ken Takashi Horii. Hearing their insights and thoughts about the work provided a whole new level of depth and understanding of their work in the exhibition. View all of the photos from this exhibition and events on our Flickr account. 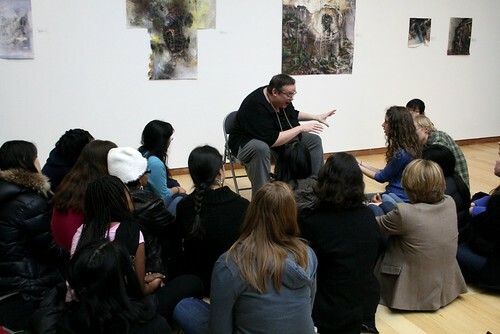 Thomas Lyon Mills speaks about his work. Ken Takashi Horii speaks to the crowd about his work. 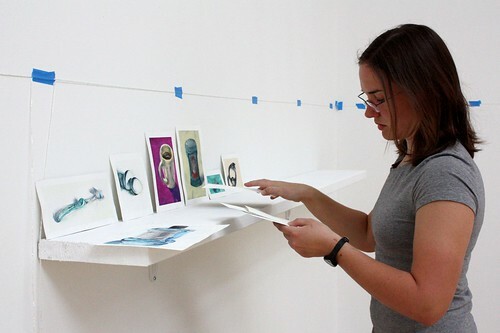 Posted by claralieu in book arts, installation, Opening Receptions, painting, Student Exhibitions. 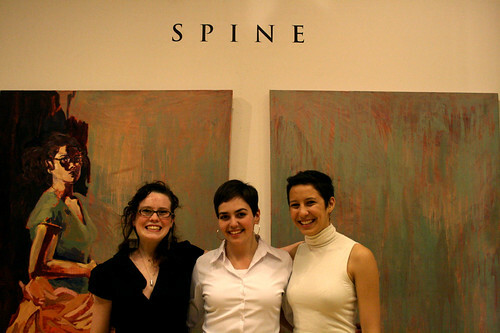 This afternoon we hosted the opening reception for “SPINE: Senior Exhibition”. 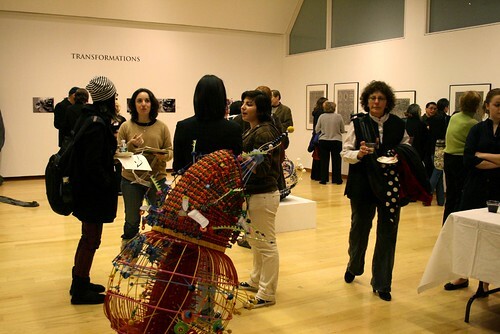 We had an amazing turn out for the show, which made for a lively and festive event. 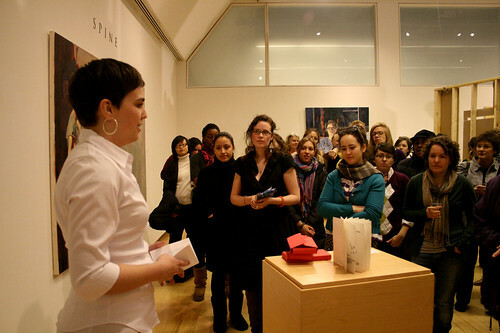 At the opening reception, each of the artists spoke briefly about their works in the exhibition. 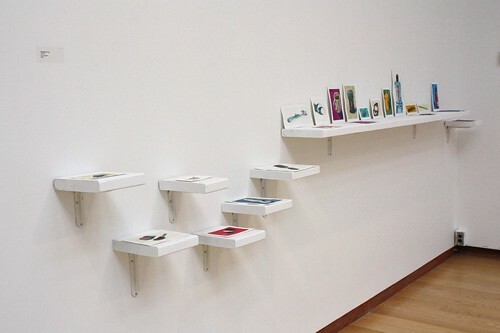 Jessica Planos discusses her artist books. 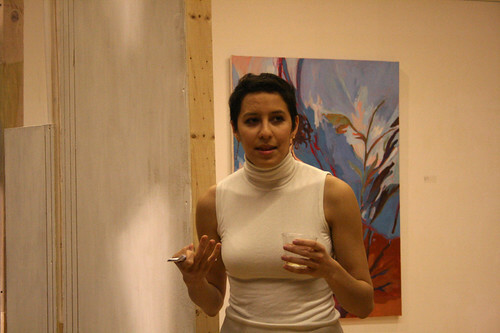 Eliza Murphy talks about her self-portrait oil paintings. Jenna Miller discusses her installation “Frame”.